It's been two years since I brewed the first batch of Thomas Brady's Ale. Originally I had intended to brew the beer on an annual basis. Unfortunately last year I was busy settling into a new house and new job, and just never got around to it. The idea for the beer came from my friend Eamon. Every New Years Day he brews his barleywine, ages it over the course of the year, bottles it in the fall, and opens the first bottle on New Years Eve. I brewed my batch a few days after New Years. Brewing on a stove-top, I made my first barleywine with an obscene amount of malt extract. Now that I have both a yard to brew in where I can use my propane burner, and my Mash & Boil that is capable of a full volume boil. That makes brewing an all-grain barleywine with a grist of over 20 pounds of grain far more practical. The bones of this all-grain recipe are very similar to the original extract version. For the last several years at Muntons our main spring barley variety has been Propino. Before I worked for the company, the North Shore Brewers had our SMaSH base malt project where members brewed beers with different base malts as a way to evaluate them. In hindsight it was fortuitous that for my SMaSH blonde the "UK 2-row" I used was Propino. Out of all the SMaSH beers brewed, I liked the one I brewed with Propino the best. New barley varieties are developed every few years as growers seek greater yields in the field and disease resistance. In East Anglia, where Muntons sources most of its barley, Propino is on its way out and Planet is on it's way in. My craft beer customers have all switched over to Planet, as I was down to about 14 pounds of Propino. Using the last of my Propino in a special beer like Thomas Brady's Ale that will be cellared for years felt an appropriate swan song. It is interesting that the grist uses both pale and lager malt. 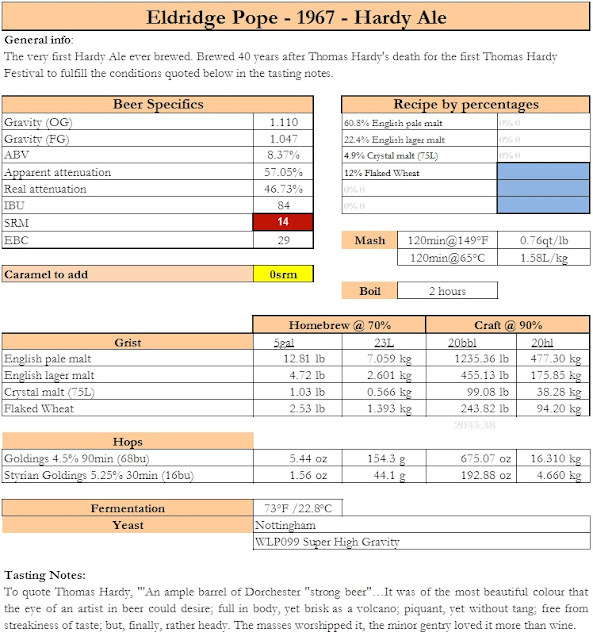 English pale malt is relatively low in diastatic power. My educated guess is that the lager malt was added to help convert the un-malted wheat in the grist. Most American brewers are not familiar with lager malt, and most homebrew shops don't sell it. Lager malt is light in color like Pilsner malt, but usually doesn't have the same honey-like sweetness. As I slowly work through a sack of wheat malt, I used wheat malt in my recipe. This makes diastatic power not a concern. Considering I didn't have any lager malt this was a good thing. I still didn't have quite enough Propino Pale Malt to replace all of the lager malt in the original recipe. As a substitute I used Muntons Super Pale Malt. Super Pale is an awesome malt. It is the lightest colored malt Muntons makes; lighter than even its Pilsner and Lager Malts. The bag I have at home is 1.3L in color. Super Pale was designed for hoppy beers, and in this recipe will allow most of the base malt flavor to come from the Propino Pale. The specialty malt in the 2017 vintage was a caramel rye malt, and I aged the beer on oak cubes soaked in rye whiskey. As I thought of which spirit I would use for this batch the choice that immediately came to mind was a bourbon made by one of my customers. 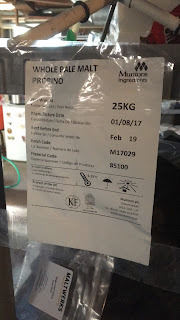 This bourbon uses a small amount of Muntons Crystal 400 which is 150L. Since the malt is in the spirit it was natural to use it in the beer. This was the second batch in a row where my yield was exceedingly poor. The last batch was a re-brew of Crackerjack Cream Ale I intended to enter into NHC. My starting gravity going into the fermenter was 1.080, barely enough for the beer to be a barleywine. When my pre-boil gravity was off, I disassembled my mill as I waited for my wort to reach a boil. I found a barley kernel that may have been causing one of the rollers to jam. I cleared that out, gave the mill an overdue brushing, and reset the gap to the factory default position. Hopefully things will be back to normal during my next all-grain batch. I really think video is a better medium for sharing tasting notes. I have never done a great job at posting tasting notes blogs anyway. As far as the quality of the videos I think they are getting better. This is the first one I shot in landscape! I'll see what I can do about the lighting. Wait till the end to see what the hum in the background is. My first video posted to the blog. I'm not sure why my last two have not. I think I have it figured out. The video and video editing are works in-progress.